A new breed of fashionable private members clubs are growing in popularity around the world, promising to be more inclusive and diverse than their stuffy older counterparts.Yet while the newer venues certainly have a far more youthful membership, and you certainly don't need to have gone to a posh school or university, they still have high joining fees and strict vetting processes.So how less elitist are theyThe 26-year-old joined Soho Beach House in Miami two years ago, after visiting with friends who were members. "It's a laidback place to network but it's also given me the opportunity to try things I typically wouldn't do by myself, like wine tastings or a jam-making class. "And sometimes I'll go to the sunset DJ parties by the pool, which are loud and pretty crazy." Welcome to the new breed of private members' club, which claim to be less restrictive and more diverse than the stuffy gentlemen's clubs of the past.These modern venues - with their co-working spaces, screening rooms and rooftop pools - are fast becoming the places where many of today's young creative class choose to work and play. Membership isn't cheap though, with some charging more than $2,000 (?1,500) per annum, along with joining fees of $300. "In the past, members' clubs were seen as being elitist and populated by people who went to the same public schools and universities," says Richard Cope, a senior trends consultant at Mintel. "But these places are more for entrepreneurs and self-made people. The only thing you have to be able to do is pay the fee, and it can be fairly expensive. "Soho House is thought to have been the first of this new wave of clubs, having opened its first site in London in 1995. However, the trend is gaining a foothold in the US and other countries. "We've see a huge jump in the number of the new types of club coming online, as compared to the traditional model," says Zack Bates of Private Club Marketing, a firm that promotes members' clubs. "In Los Angeles, you can't get into Soho House. So others are being built, the Hospital Club, Griffin House and Norwood, to keep up with the appetite for these spaces." Soho House itself now boasts 18 venues around the world, including in New York, Istanbul, Berlin, and soon Mumbai. Group revenue rose 3% in 2016 to ?293.4m, while global membership jumped from 56,000 to 70,000.However, you have to do more than just fill out an application to join its venues. Membership costs between ?400 to ?1,500 per annum, depending on the club, although there are discounts for under-27s. How do you like your wine - with a cork or screw-cap? And there's a tough background check to ensure potential members are part of the creative class - Soho House frowns on those who work in financial services, for instance. Once accepted, members enjoy a host of perks. Soho House Barcelona, for example, one of the chain's newest venues, boasts a retro-themed gym, pool and free classes like yoga.Members pay full price for food and drink but get discounts on the club's hotel rooms.Mr Cope says: "These clubs offer people a discreet place to network and wind down, typically in cities where personal space is at a premium." However, they are also about showing off to a degree, he says. "In an age of social media, people like to let others know where they hang out or which restaurants they eat at. So there's an element of satisfying those peacock tendencies." The newer clubs do serve more practical functions, though, such as offering young entrepreneurs a place to work. 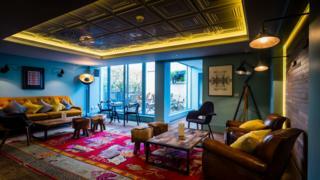 Take London's Hospital Club, based in Covent Garden, which offers its own meeting and conference rooms, and even an in-house TV and music recording studio. Standard membership costs ?865 plus a ?250 joining fee. While some might find such fees high, it's still cheaper than forking out for your own office space, says Mr Bates. "It suits today's digital nomads, who work remotely via their laptops. Paying for an office can be prohibitively expensive, especially in a major city." Members' clubs also offer vital networking opportunities that help further your career, says Zikki Munyao, 40.The remote IT worker joined Common House, a private member's club in Charlottesville, USA, largely for this purpose. "There are areas to socialise and meeting spaces where I can have privacy," he says of the club, where membership costs $150 (?113) a month, plus a $600 joining fee. "I even met my estate agent over a game of pool. "The new breed of members' clubs does face challenges, though. Some warn that as clubs proliferates, their exclusivity is becoming diluted. Notably, as their membership circles widen, they struggle to attract the celebrities that once lent them cache.The social commentator Peter York tells the BBC: "Traditionally private members' clubs have played on their exclusivity and being able to attract the 'magic people'. "But as more and more of them pop up, you get blase. The magical people also can't be corralled in one place anymore." He adds that as clubs like Soho House keep expanding, they seem to be "more about business" which further dilutes their brand. "The danger is that a new challenger, which looks younger and groovier, arrives and steals your limelight." But Mr Cope believes the market for these new clubs is going to expand. "Having somewhere where you can unwind and host friends in the centre of cities is useful. So there are a lot of practicalities around this. "It is also about expressing your individuality, so I think the emotional need for this is only going to grow."